London knows how to put on a good party. Even the sunsets can manage it from time to time. See what skies around the world look like this week. Great shot! Reminds me of a scene from Mary Poppins . . .
wow! this is a fantastic capture!! Just Love the London rooftops, and this is a great picture! A great shot ! Reminds me of a stage set. Happy parties in swinging red London! What an absolutely AWESOME shot!!! I'm gonna try and get good sunsets when I'm Down South next week, but I bet none of them will even hold a candle to this one! Sure looks like the old town is ablaze. Fantastic sky! Out of this world! Beautiful sky shot. Love the building silhouettes. Happy Skywatch Friday! Amazing picture! Looks almost like a painting. Wow. This is a stunning photo. I've got to agree with B Squared; it looks like the whole city is on fire. Great! I love the sunset and its melancholic mood. Have a nice weekend, Mo. A super London skyline image, Mo! Love those London rooftops. Excellent colors...great photo. Wow... that's just amazing, Mo. Thank you so much for sharing. As someone above said, it does look almost like something out of the chimney sweep scene in Mary Poppins! Have a lovely weekend. Great photo. Makes me think of the paintings Rolf Harris used to do. Wozzer (there's a word you don't hear very often!) What a stunning sky, too good for swf! Gorgeous. Gorgeous! I love how the rays seem to go straight up from the sun. Perfect silhouette too! Sunsets remind me of my watercolor palettes. When I first started learning watercolor, my teacher made me paint skies only for an entire year. This picture looks like thalo blue and vermilion hue spilled all over a canvas. To get the grayish shade in the photo, mix the blue and orange. Mo, I like name, by the way. Soooo pretty! Especially like the pink "rays." This is a beautiful picture. One of my favorites so far. Kepp up the good work! love this shot, MO. awesome! This is absolutely beautiful! 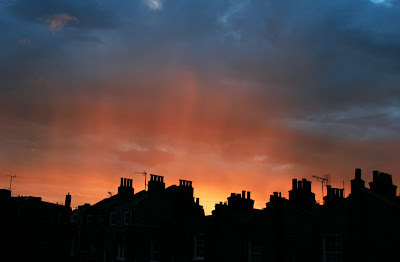 Lovely range of colours and well captured with just the perfect amount of rooftop in silhouette! Thanks for visiting my blog. Corfe Castle is managed by National trust so you can find about it on their website. I think it would be difficult to reach by public transport - you'd need to go by car, but it is lovely. What an awesome sunset - the colors are exquisite and I love the silhouettes below. Fabulous! I love your blog - it reminds me how much I miss London.